A slim, rechargeable battery tucked into this wristlet provides a discreet smartphone charge. 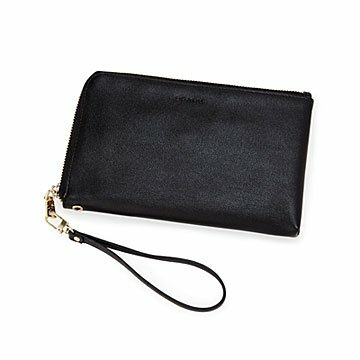 Whether you're hustling through back-to-back meetings or gearing up for a night out, this stylish wristlet keeps your smartphone charged on the go. A slim rechargeable battery sits snugly inside to power up your phone discreetly (up to 1.5 times) without being tethered to a wall outlet. The concealed USB power cord for the battery lets you recharge your secret power source inconspicuously during downtime. Made from supple vegan leather in black, red, or gold, the design also incorporates credit card slots and a zippered interior pocket. It works with all micro-USB charging phones, as well as iPhones, and its Auto-Power On technology means there's nothing to switch on or off. Made in China. Our batteries have been tested and certified to meet Apple "Made For iPhone" standards. All our batteries have input/output overvoltage protection, short circuit protection, and output over current protection. The receivers mind is now at ease knowing she can always be reached on her cell phone for possible emergency child related calls. Purchased for my daughter, the social butterfly. She travels frequently. She is prone to mishaps with her cell phone, so this purse keeps it secure, and easily charged.